If you’re someone who gets migraine headaches often, don’t feel alone. According to the American Chiropractic Association, nearly nine out of 10 Americans suffer from headaches, and migraine headaches affect as much as 12 percent of the population. In the U.S., the cost for curing migraines is between $5-17 billion annually, and when patients get tired of prescription pills not working sufficiently, they seek chiropractic help. Fortunately, chiropractic full-body adjustments have been shown to help with decreased severity and frequency of headaches and migraines. At ChiroNow in Loveland, we offer walk-in chiro care services that range from full-body adjustments to sports physicals. If you or someone you love is suffering from recurring migraine headaches, we encourage you to stop by our office in Loveland, Colorado, or to give us a call today! Here is the basic breakdown of what exactly causes migraine headaches and how chiro care can provide a natural remedy alternative to prescriptions and pills. Headaches are caused by a variety of issues, which may include food sensitivities, behaviors such as insomnia or blood sugar changes, or environmental surroundings such as loud noises or strong lighting. Most migraine headaches have some association to muscle tension in the neck, as most Americans are guilty of staring at technological devices all day or not getting enough physical activity. Living a sedentary lifestyle can increase joint irritation and muscle tension in your upper body, ultimately causing your head to ache. How Can You Prevent Headaches? Chiro care can help relieve headaches that are caused by misalignments or subluxations in the spine, without patients having to remember to pop a pill. Exercise! Even 30 minutes of low-impact exercise can help relieve the tension and stress in your neck that causes headaches. If you’re a cubicle warrior who stares at a fixed screen for a good portion of your day, get up and move around every 30 minutes to an hour. Don’t clench your teeth. Though this is often involuntary, be aware of the moments when your top teeth are touching your lower ones.This results in stress at the temporomandibular joints, which basically translates into you getting a form of tension headaches. Drink water! Dehydration is a huge cause of headaches, so by drinking at least 8 ounces of water daily, you can avoid that issue. Studies have found that spinal manipulation by chiropractors can help with migraine headaches. By alleviating the stress on your system, the outcomes that are improved by chiropractic are typically migraine frequency, the intensity of the migraine, the duration of it and overall, patients reported a better quality of life. Your chiropractor might also provide additional advice, such as tips for a better nutritional diet for your headaches or the suggestion of B complex vitamins. They’ll also likely give you some posture exercises to work on at home to relieve any irritation or tension of muscles that could be causing your migraine headaches. 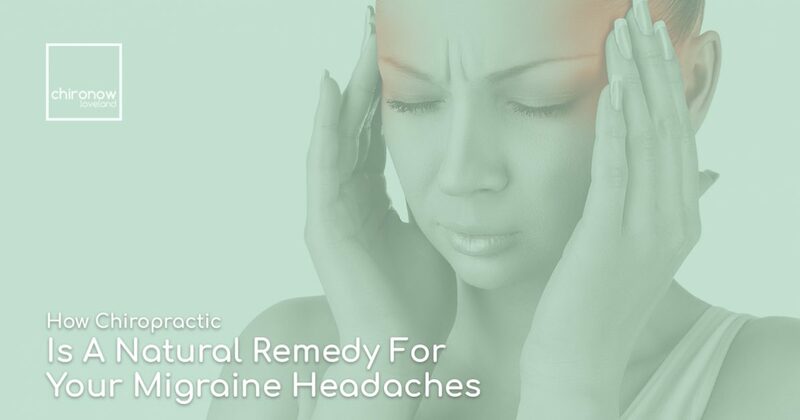 Are you ready to let Northern Colorado’s top chiropractic office help you with your migraine headaches, or perhaps other neck and back pain you’re experiencing? At ChiroNow Loveland, our doctor of chiropractic uses modern techniques and has a stylistic approach to chiropractic. We want to make sure our patients leave our office feeling better than they did when they first stepped through our doors. If you need help or have any further questions, we encourage you to give us a call at (970) 372-0286 or to fill out our online form. We are also give services on a walk-in basis, so stop by and let us help you manage your pain today!